THROUGHOUT the spring and summer of 1955, small bands of men worked feverishly against the clock in London. They had a deadline to meet — September 22, 1955 — the night they must open a new television service in Britain. Only the London area would see the new programmes to begin with — the rest of the country would follow at gradual intervals. Two companies had been awarded programme contracts by the Independent Television Authority to provide the London service. They were Associated-Rediffusion, who had to provide the Monday-Friday weekday programmes; and Associated Television who had to provide programmes at weekends. 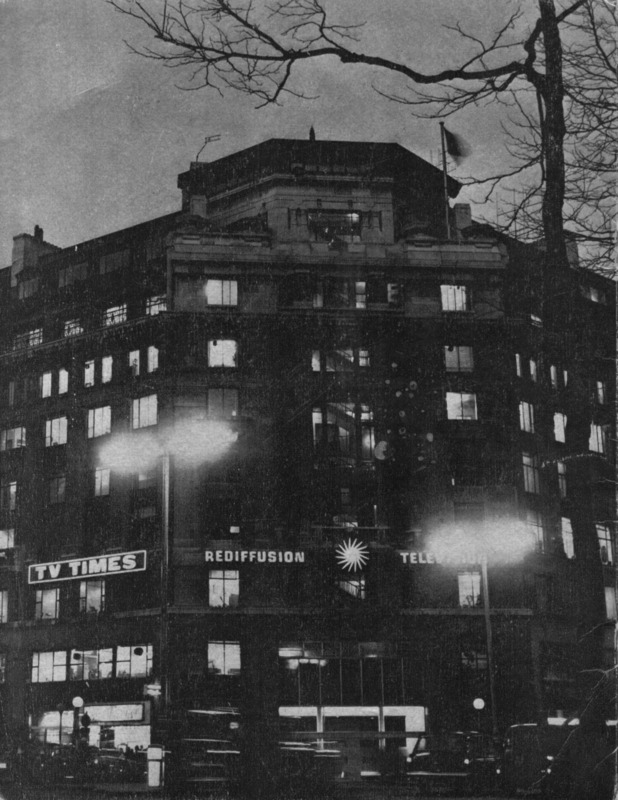 Independent Television News, whose job was to provide a news service had been established and Associated-Rediffusion had undertaken the publication of TV Times for the whole ITV network. The men at the top of these companies started with almost nothing but their own determination and energies. They had no staff, no permanent office premises, no studios, no cameras, no sound equipment. And they had only 11 months altogether, from the date of the announcement that they had been awarded programme contracts in October, 1954, to the date on which the new service had to begin, to mount programmes capable of challenging the mighty BBC. They began with temporary make-shift offices. The top men of Associated-Rediffusion found themselves housed in six offices in Stratton House, Piccadilly — comfortable enough to begin with; but a bit overcrowded when recruiting boosted the staff to 60! 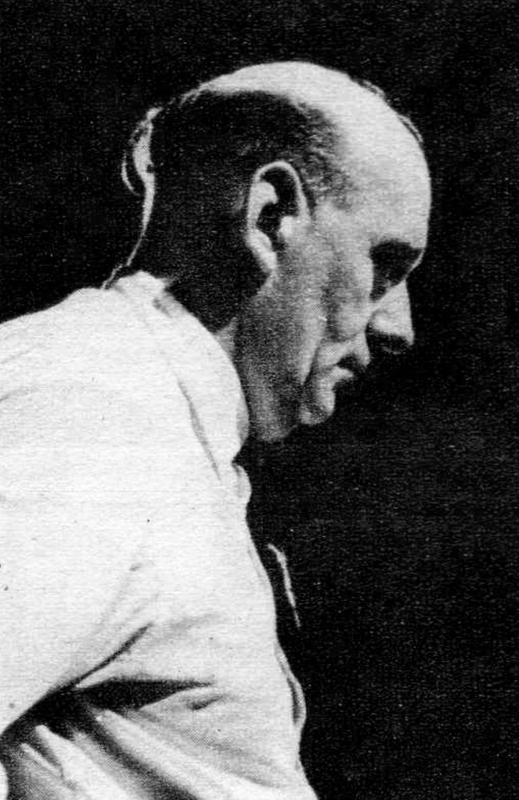 Lloyd Williams, then assistant Controller of Programmes for Associated-Rediffusion, recalled that conditions in Stratton House grew chaotic. The big task for all the companies was to find suitable premises and recruit skilled staff. As early as the frosty weeks before Christmas, 1954, Commander E. N. Haines, Managing Director of Central Rediffusion, the company providing technical services to Associated-Rediffusion, was tramping round London looking at possible studio sites. The choice eventually fell on the old Twentieth Century-Fox studios at Wembley. “Studios” was hardly the right word — there was only one big studio. And Haines needed at least four. “We had builders and installing engineers in the same night the filming finished,” said Haines. “The ship was quickly unrigged and the tank emptied. Then we started building the four studios. “The real problem was dust. We had only eight months from scratch to get everything ready and the trouble with rushing a job like this is that you are inclined to get technicians and gear in place before the place is dust-free and that can create an awful lot of trouble. 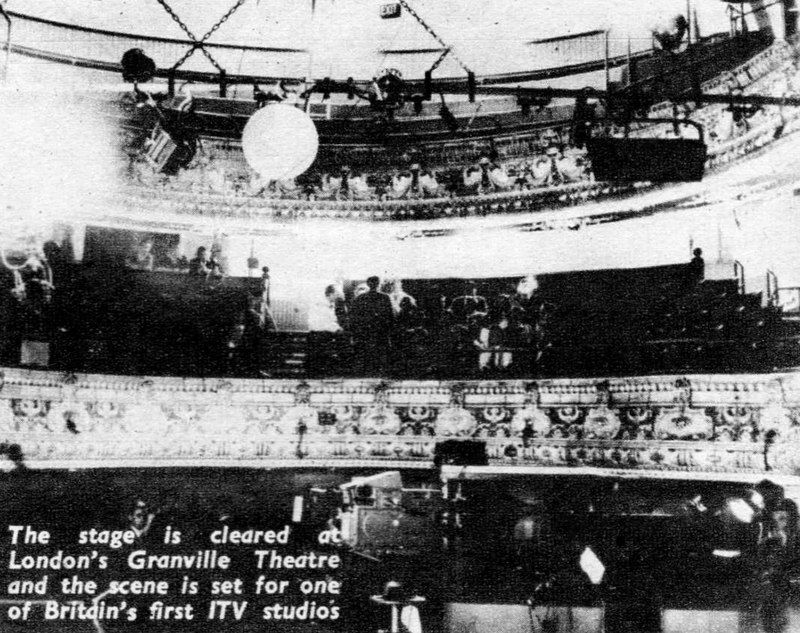 Associated-Rediffusion also bought the old Granville Theatre in Fulham Road as studios — which meant taking the whole theatre to pieces, turning the stage around, tearing out the old dressing rooms and redesigning everything to TV studio specifications. But the real nail-biting problems centred round Adastral House in Kingsway, the giant rabbit-warren of out-of-date offices from which the air war against Germany had been directed. Although a 50-year lease was taken out in January, the company were unable to get in until the Air Ministry moved out — which was not until late in May. Then the gigantic job of tearing the whole place asunder and redesigning it began. 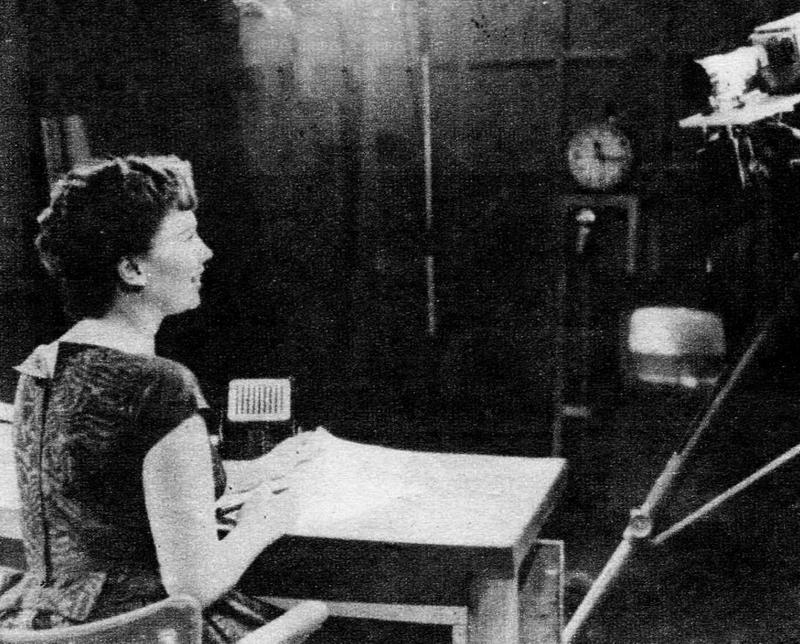 ATV, with only the weekend programmes to worry about (their transmission in the Midlands did not begin until the following spring) were able to manage in London with one big studio, the old Wood Green Empire in North London and a smaller studio and master control room in Foley Street, near the G.P.O.’s Museum Exchange, through which all TV lines pass to the transmitters. For office space, they hired two floors in Television House. “My overriding memory of the very early days,” said Keith Rogers, “is of a small group of us. Bill Ward, then Head of Light Entertainment, now Executive Controller, Elstree Studios, his deputy, Frank Beale, Terence MacNamara. the chief engineer, and myself, sitting on the floor of an office in Regent House in the evenings, plans for studios and equipment scattered all around us, trying to work out exactly what were our requirements. “We needed a complete outside broadcast set-up, with two or three O.B. vans, fully equipped. We required a control room, equipped with telecine, sound and vision mixing and also a full-sized studio (we got Wood Green) where we could stage variety and light entertainment programmes. By July, the job still seemed an impossible one. Skilled television technicians were at a premium. Men, of course, were being lured away from the BBC by prospects of promotion and better pay. But, nevertheless, staffs slowly grew. Men like Presentation Officer Cyril Francis quit a job in commercial insurance to join; Neil Bramson gave up a career as a professional French-horn player with a leading orchestra. Muriel Young gave up acting to become an announcer. Chris Chataway chucked a safe job with a big brewery concern to become a newscaster with ITN. In July, staffs at last moved into Adastral House, by then renamed Television House. Few offices were ready for occupation. Pneumatic drills thundered everywhere; barrow loads of cement were trundled up and down; dust fell in showers. Women employees were given a hairdressing allowance; the men were told to have their suits cleaned once a month at company expense. The Associated Broadcasting Company brings to the field of independent television a Board of Directors whose combined experience in public service and entertainment is unrivalled. A.B.C.’s Chairman, Prince Littler, has occupied a prominent place in the field of entertainment for many years and, among his other directorships, includes that of Moss Empires Ltd., Stoll Theatres Ltd., Associated Theatre Properties and many other theatre-owning and theatre-managing organisations. 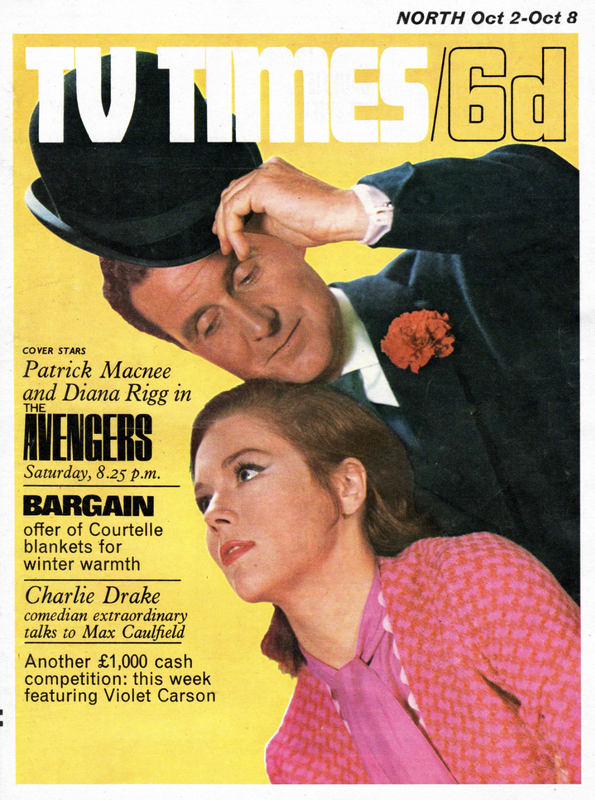 A.B.C.’s Vice-Chairman, Norman Collins, a former director of the B.B.C.’s Television Service, has been in the forefront of the battle to bring independent television to Britain and has been closely associated with every stage of its development. The Members of the Board of Directors and the Management Committee of A.B.C. include: the outstanding figure of the Variety world — Val Parnell; Richard L. Meyer, a pioneer in independent television; Harry Alan Towers, one of the foremost independent producers and distributors of radio and television programmes and Lew Grade — one of Britain’s leading agents and an important figure in the entertainment field. A.B.C. has been entrusted, initially, with the responsibility of providing the programmes for the London Station on week-ends and for the Birmingham Station, Monday to Friday. It is, therefore, the only independent television programme contractor with a programme responsibility which extends over the whole seven days of the week. A.B.C. has predominantly turned to the field of experienced technicians and producers and numbers among its staff some of the many whose knowledge of television extends back to its earliest days in Britain. Heading its Light Entertainment Department is Bill Ward, associated with many of television’s best-known shows. Keith Rogers — another pioneer of television — heads the O.B. side; and, in the initial stages, his responsibility extends considerably beyond the Outside Broadcast field. Individual directors whose services are available to A.B.C. include Bill Lyon Shaw, Denis Vance, Desmond Davis, Henry Caldwell, Dicky Leeman, Leonard Brett, Stephen Wade, Cecil Petty and many more. A.B.C. has converted Wood Green Empire — one of the largest suburban Variety Theatres — into one of the most modern and best equipped Television Theatres in the world. It is from here that many of the top Variety Productions of A.B.C. will originate. In addition, through the interests of its Directors, A.B.C. will have available many of the best known theatres in London and the Provinces, including the London Palladium, whence will originate, each Sunday night a Variety highspot — SUNDAY NIGHT AT THE LONDON PALLADIUM. A.B.C. 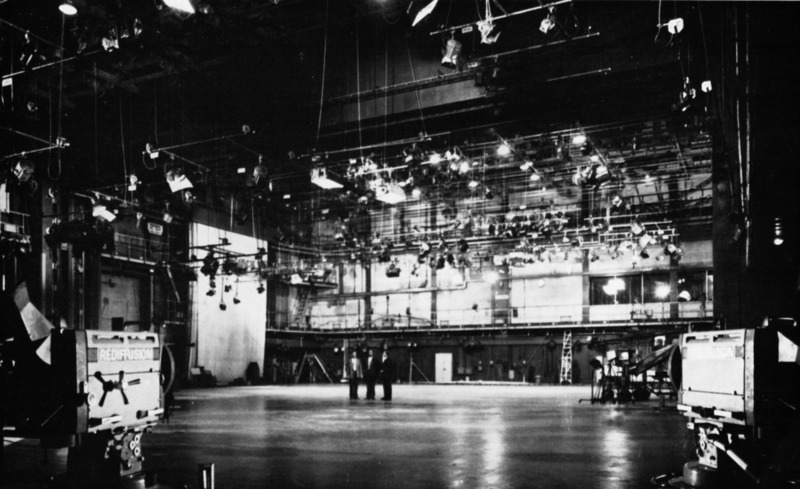 has recently acquired the British National Studios at Elstree — a fully equipped modern motion picture production centre where many of the television films which A.B.C. is presenting are being made. Through other Directors of A.B.C., the Company has a link with Highbury Studios and Nettlefold Studios — two other centres for the production of television films. Many of A.B.C.’s major programmes will be produced for it by the Incorporated Television Programme Company Limited, with which Prince Littler, Val Parnell, Lew Grade and Harry Alan Towers are also associated. This Company, founded by public relations expert Suzanne Warner, adds further show-business strength through members of its Board, who include Hugh Beaumont, of H. M. Tennent Limited, Stuart Cruikshank of Howard & Wyndham Theatres, Phillip and Syd Hyams of Eros Films, John Schlesinger of the Schlesinger Organisation and Anthony Gishford of Boosey and Hawkes Limited. The nerve centre of A.B.C.’s week-end operation is the modern control centre at Foley Street, London, within 200 yards of Museum Exchange — the nerve centre of the micro-wave and coaxial cable linking system of the G.P.O. A.B.C. will also be developing a studio centre in Birmingham. These are some of the personalities and facilities which together, will be ensuring that A.B.C. T.V. fills an important role in the pioneering and development of independent television in Britain. Note: after less than a month on air and following a court battle with the Associated British Picture Corporation who owned the ABC cinema chain, Associated Broadcasting Company Ltd was renamed Associated TeleVision Ltd (ATV). It is not related to ABC Weekend Television, who provided the programmes at weekends in the Midlands and the North from 1956-1968, who were a subsidiary of the Associated British Picture Corporation.